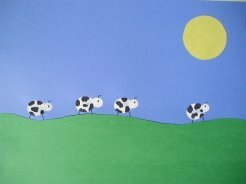 The Cows in the Field craft is the perfect animal craft for toddlers on up. They'll need help cutting the shapes but they'll love to make the cows all by themselves! 1. From a green piece of construction paper cut out a strip of green grass. Cut out a round yellow circle for a sun. Glue or tape these pieces on to a sheet of blue construction paper. 2. Pour some white paint into a paper plate or shallow dish. Dip a finger into the paint and press onto the paper (some where close to the grass would be good). Dip another finger into paint and press again to make the cow's head. Repeat for as many cows you would like in your field. 3. Once the white paint is dry, draw on spots, eye, horn and legs, with a black marker. Another alternative is to dab on the spots with a Q-Tip tiped in black paint.